Corresponding authors. E-mail addresses: zy_zhangying@163.com (Y. Zhang), bszhang@imr.ac.cn (B. Zhang). Abstract: The design and fabrication of semiconductor photocatalysts have attracted much attention. 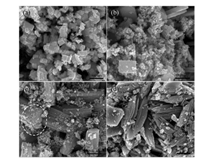 Herein, the effect of pH value and soluble salt additives on crystal structure, morphology and photocatalytic properties of WO3 was investigated in detail. It was found that the phase structure of WO3 changed from monoclinic to hexagonal phase when pH value of the solution increased. The ultraviolet-visible absorption spectra show that the monoclinic and hexagonal WO3 had absorbance from 600 nm to the ultraviolet-visible region. Hexagonal WO3 with nanofiber bundle morphology was successfully synthesized through Na2SO4 and Zn(CH3COO)2·2H2O-assisted hydrothermal method when pH value was 0.8. It exhibits the highest photocatalytic efficiency and better than that of cubic-shaped monoclinic WO3. The shuttle-like hexagonal WO3 prepared at pH 1.4 gives much lower activity. 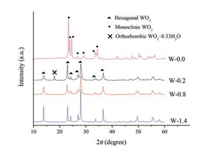 The morphology is a decisive parameter for the photocatalytic properties of WO3. Over the past decades, WO3 attracted extensive attention because its unique properties can be widely applied in the field of photocatalysts [1, 2], electrocatalysts , gas sensors , electrochorimic [5, 6], and so forth. Among various applications, WO3 photocatalysts have received considerable interest due to its resistance to photocorrosion and visible-light-responsive [7, 8]. In order to improve the photocatalytic activity of WO3, many attempts have been made to probe the relationship between physic-chemical properties and morphology, composition and structure of WO3 [9-11]. For instance, WO3 nanostructures with nanoplates, nanorods and nanowires exhibit different photocatalytic activities . Another example is WO3 with hexagonal and monoclinic phase shows different absorption ability as well as in photocatalytic activity . Thus, the controlled synthesis of WO3 is a key issue in semiconductor photocatalysts to achieve desired performance. As a result, much effort have been made to develop new synthetic techniques to control WO3 nanostructures, including hydrothermal synthesis [12, 13], acid precipitation , electrospinning , microwave-assisted synthesis , sol-gel approach  and thermodecomposition method . Among them, the hydrothermal method is widely applied to synthesize photocatalysts with different morphology, and it is a very promising process in terms of low reaction temperature, environmentally friendly, and large-scale production . A great variety of structure directing agents were found to modulate the crystal growth of WO3, including inorganic salts, organic acids, polymers and surfactants [19-21]. Herein, the effect of pH value and additive on the crystal phase, morphology, optical and photocatalytic properties of WO3 were investigated in detail. WO3 nanofiber bundles were synthesized through the soluble inorganic combined with organic salt-assisted hydrothermal method by tuning the pH values of solution. In a typical synthetic procedure, 0.5 μmol (NH4)10W12O41·xH2O and 5 μmol Zn(CH3COO)2·2H2O were dissolved in 60 mL of deionized water by ultrasonic treatment and magnetic stirring. Then 3 g Na2SO4 was added into the above mixture. After the pH value of the solution was adjusted to 0.0, 0.2, 0.8 and 1.4, the mixture was transferred into a Teflon-lined stainless steel autoclave and maintained at 180 ℃ for 24 h. The final products were collected by centrifugation, washed three times with deionized water, and dried in air at 60 ℃ for 24 h. The obtained samples were denoted as W-0.0, W-0.2, W-0.8 and W-1.4, respectively, where the number represents the pH values of the reaction solution. The sections of WO3 characterization and photocatalytic activity measurements can be found in Supporting information. 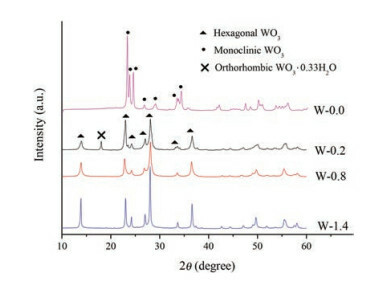 To reveal the effect of pH value on the formation of WO3 nanostructures, the X-ray diffraction (XRD) patterns of W-0.0, W- 0.2, W-0.8 and W-1.4 are shown in Fig. 1. As shown in Fig. 1, W-0.8 and W-1.4 are indexed into the hexagonal WO3 (h-WO3) phase (JCPDS No. 85-2459) without impurity. Furthermore, it was found that the intensity of h-WO3 characteristic peaks increased with the pH value increase. This observation indicates that the higher pH value would lead to a higher crystallization rate of h-WO3. When the pH value of solution decreases to 0.2, the peaks of orthorhombic WO3·0.33H2O phase (JCPDS No. 35-0270) emerges, and when the pH value of reaction solution reaches 0.0, all peaks are assigned to monoclinic WO3 (m-WO3) phase (JCPDS No. 89- 4476). In addition, m-WO3 showed a preferred orientation (002) axis (2θ = 23.38°). It indicates that the pH value of the reaction solution has a significant effect on the phase structure. A low pH value could lead to the phase-transition of as-grown samples from the h-WO3 to the m-WO3 phase. Fig. 1. XRD patterns of W-0.0, W-0.2, W-0.8 and W-1.4 samples. For probing the effect of pH value on the morphology of WO3, scanning electron microscopy (SEM) was performed on these samples. As shown in Fig. 2, when the pH value of solution increased from 0.0 to 0.2, the morphology of WO3 nanoplates (Fig. 2a) changed to mixed morphology with fine nanoparticles and nanorods, and the thickness is ca. 110-160 nm and the length ranges from 600 nm to 760 nm (Fig. 2b). At pH 0.8, the WO3 morphology shows relatively large rods with a length of 1-2 μm (Fig. 2c). Further insight into the morphology of W-0.8, 1D naonfibers were observed at one side of the large rods structure as highlight by circles. The morphology of W-0.8 dispalys nanofiber bundles. When the pH value of solution increased to 1.4, shuttlelike WO3 with a length of 3-4 μm was observed (Fig. 2d). It is obvious that the morphology of WO3 samples depended on the pH values. Fig. 2. The SEM images of WO3 samples: W-0.0 (a), W-0.2 (b), W-0.8 (c) and W-1.4 (d). Based on the above mentioned experimental results, the mechanism for the WO3 morphology evolution from nanoplates to nanofiber bundles is discussed. The publication reported that the WO3 morphology is closely related with its crystal phase, and the morphology of the nanostructures can have a significant effect on obtaining stable phase . Therefore, the 1D fiber-like shape in W-0.8 is beneficial for stabilizing the metastable hexagonal channel structure [12, 23, 24]. Furthermore, the number of nanopartilces was decreased when pH value increased from 0.2 to 1.4, which indicates that the number of initially generated nuclei is correlated to the degree of acidity [21, 25]. In a highly acidic medium, many H2WO4 crystal nuclei are formed rapidly due to the high level of supersaturation and therefore the subsequent crystal growth is rate-determining step. Hence, in highly supersaturated systems more but smaller crystals are expected to be formed whereas in less supersaturated systems fewer but bigger structures could be expected. Our experimental results showed that the increase in pH from 0.8 to 1.4 resulted in a considerable size growth. Fig. 3 shows the schematic illustration of the formation process of WO3 nanofiber bundles. Fig. 3. Schematic illustration of the formation process of WO3 nanofiber bundles. The element composition of W-1.4 sample was analyzed by energy dispersive X-ray spectroscopy (EDS). Only W and O elements were detected (Fig. S1 in Supporting information, carbon is from the conductive adhesive). EDS spectra confirmed that there is no zinc element in WO3, which is consistent with the XRD result. In order to deeply unravel the structure of W-0.8, transmission electron microscopy (TEM) and high-resolution (HR) TEM were performed. As shown in Fig. 4, the nanofiber bundles structure can be clearly observed in low-magnification TEM images. In fact, the nanofiber bundle morphology of WO3 is composed of much smaller fibers with d = 10-15 nm. In HRTEM image (inset of Fig. 3), the lattice fringe of h-WO3(100) was indentified based on JCPDS No. 85-2459 card. Fig. 4. Low-magnification TEM and HRTEM images of W-0.8. Because the crystal growth of semiconductor photocatalysts can be influenced by additive [18, 25], Fig. S2 (Supporting information) shows the morphology of WO3 prepared at pH 0.0, 0.2, 0.8 and 1.4 without Zn(CH3COO)2·2H2O addition. At pH 0.0 and 0.2, the WO3 samples remain the nanoplates and nanorods mixed with fine nanoparticles morphology, respectively. At pH 0.8, the obtained samples possess nanowires morphology. The length of nanowires increased from ca. 0.5 μm to several micrometers when the pH value of solution increased from 0.8 to 1.4. It is clearly that the effect of Zn(CH3COO)2·2H2O on the morphology of WO3 is not obviously at low pH level, while at high pH level, this effect is essential to the formation of well-defined WO3 nanofiber bundles photocatalyst. The presence of Zn(CH3COO)2·2H2O decrease the aspect ratio of hexagonal WO3. 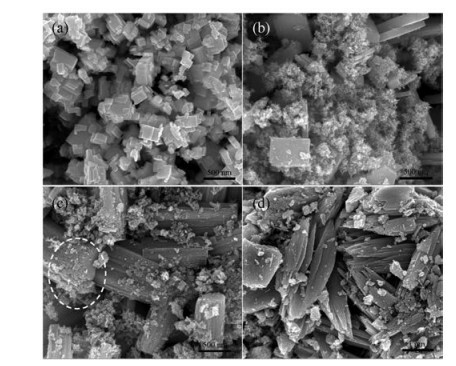 In order to confirm the effect of Na2SO4 additive on the morphology of WO3, the SEM images of WO3 prepared at different pH without Na2SO4 additive are shown in Fig. S3 in Supporting information. At pH 0.0 and 0.2, the WO3 samples remain the nanoplates and nanorods mixed with fine nanoparticles morphology, respectively. At pH 0.8 (Figs. S3a and b), the obtained sample exhibits a mixed morphology with nanoparticles aggregations and nanorods. At pH 1.4 (Fig. S3c), the sample is composed of sea urchin-like WO3. It is obviously that the sea urchin-like morphology was composed of nanorods with different length, which assigned to the hexagonal WO3 phase (Fig. S3d). WO3 with bundle nanostructures cannot be obtained when no Na2SO4 was added in the precursor solution. 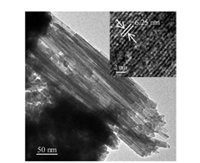 This result indicates that the well-defined WO3 nanofiber bundles could not form without Na2SO4. The optical properties of W-0.0, W-0.2, W-0.8 and W-1.4 samples were measured by ultraviolet-visible (UV-vis) absorption spectra, as shown in Fig. 5. The strong absorption of W-0.2 begins at around 460nm, while W-0.0, W-0.8 and W-1.4 exhibit a broad absorbance from 600nm to the UV region. Meanwhile, the absorption intensities of W-0.8 and W-1.4 with hexagonal structure are higher than that of W-0.0 with monoclinic structure. The band gap values (Eg) of the photocatalysts were determined by extrapolating the liner part of the plots of (Ahv)2 versus the energy of exciting light. The calculatedband gaps (Fig. 5b) of W-0.0, W-0.2, W-0.8 and W-1.4 are 2.79eV, 3.20eV, 3.02eV and 2.95eV, respectively. It was shown that the Eg value of W-0.0 is smaller than those of W-0.8 and W-1.4 owing to the structure differences between monoclinic and hexagonal phase . In addition to the effect of the crystal phase, the size of the nanostructures also plays a dominant role in the optical properties [12, 18]. The surface areas of W-0.0, W-0.2, W-0.8 and W-1.4 measured by the BET method (SBET) are 8.7m2/g, 44.4m2/g, 28.5m2/g and 10.5m2/g, respectively. The particle size is inversely proportional to the SBET. Therefore, the apparent blue shift in the Eg of W-0.8 and W-1.4 can be explained by the size difference.The orderof band gaps is inversely proportional to the particle size of the samples. Fig. 5. (a) UV–vis absorption spectra of WO3 samples, (b) (Ahν)2 versus energy plots. Fig. 6 displays the photodegradation of Rhodamine B as a function of irradiation time over W-0.0, W-0.2, W-0.8 and W-1.4, respectively. It was found that the morphology and the crystal structure had significantly effect on the activity of WO3. After 180min of irradiation, 40.5%, 44.1%, 65.7% and 18.9% of RhB were degraded by the W-0.0, W-0.2, W-0.8 and W-1.4, respectively. The degradation of RhB could be described by the first-order kinetics of ln(Ct/C0) versus reaction time: -ln(Ct/C0)= kt, where k is the rate constant, C0 and Ct represent the concentrationof RhB at initial and reaction time. As shownin Fig. 6b, the reaction rate constants (k) of W-0.0, W-0.2, W-0.8 and W-1.4 were 0.0030min-1, 0.0032min-1, 0.0061min-1 and 0.0011min-1, respectively. Fig. 6. Photodegradation effects of RhB over WO3 samples. All obtained results for different WO3 samples have been summarized in Table 1. The W-0.0 and W-0.2 samples had similar photocatalytic performance, although the latter has the largest special surface area. W-0.0 was pure monoclinic nanoplates, while W-0.2 was the mixture of hexagonalWO3 and WO3·0.33H2O with a mixed morphology of nanorods and nanoneedles. The band gap energy (ca. 2.79eV) of W-0.0 is the smallest one among all the samples, which means that it could theoretically absorb most of the irradiated light. By contrast, W-0.2 showed the highest band gap energy (ca. 3.20eV) among the samples, but it exhibits similar efficiency compared to W-0.0. It indicates that beyond the light absorption, the different morphology, special surface area and the mixture of phase structures in W-0.2 play important roles. The higher special surface area and the smaller nanoneedles structure in W-0.2 could improve the photo-efficiency. In addition, the contact of various crystal phases could beneficially affect the overall performance as it was shown for other nanostructures, such as the mixture of anatase and rutile TiO2. Physical property of WO3 samples and corresponding degradation rate. Although both W-0.8 and W-1.4 have hexagonal structure, the W-0.8 sample has the highest photodegradation in this study, and the degradation rate of RhB is 65.7% after 180min of irradiation. It exhibited more than three times higher photocatalytic activity than that of W-1.4 (the degradation rate of RhB is 18.9%). The excellent performance of W-0.8 is attributed to the large special surface area and advantages of the hierarchical built-up structure, which makes possible a high efficiency charge transport and favors the separation of the photogenerated charge carriers . The basic three steps of photocatalytic reactions are 1) photoexition of charge carriers; 2) charge carrier separation and diffusion to the photocatalysts surface; and 3) oxidation and reduction reaction on the catalyst surface . The structural and electronic properties of the semiconductor influence the efficiency of step (1) and (2). A semiconductor with different morphology not only has different band gap but also has defects that affect the recombination rate of photogenerated carriers. Therefore, the activity of WO3 is affected by the morphology . The special surface area of W-0.8 is smaller than that of W-0.2 and the band gap of W-0.8 is larger than those of W-0.0 and W-1.4, but it has the highest photocatalytic activity. It could be attributed to the nanofiber bundle structure enhanced light harvest via multiple reflections . The enhanced light harvest can increase the concentration of superoxide (·O2-) and hydroxyal radical (·OH) to decompose RhB. In summary, the nanofiber bundles WO3 photocatalyst was successfully synthesized by salt-assisted hydrothermal method. The pH value, inorganic and organic salt additives play important roles in the formation of WO3 with different crystal structure and morphology. As pH value increases, the asprepared WO3 converted from monoclinic to hexagonal phase and the morphology transformation were observed. The nanofiber bundles WO3, which is composed of fiber-like bundles structure, exhibited the best photocatalytic degradation performance for degradation of RhB. We gratefully acknowledge the financial support provided by the Foundation of Liaoning Educational Committee (No. L2016004) and Natural Science Foundation of Liaoning Province (No. 2015020209). Dr B. Zhang acknowledges the financial support provided by the National Natural Science Foundation of China (Nos. 91545119, 21773269 and 21761132025) and Youth Innovation Promotion Association CAS (No. 2015152). Supplementary data associated with this article can be found, in the online version, at https://doi.org/10.1016/j.cclet.2018.03.009. S.S. Shendage, V.L. Patil, S.A. Vanalakar, S.P. Patil, N.S. Harale, Sens. Actuators BChem. 240 (2016) 426-433. Y. Yan, Y.F. Wu, Y.T. Yan, W.S. Guan, W.D. Shi, J. Phys. Chem. 117 (2013) 20017-20028. J. Su, X. Feng, J.D. Sloppy, L. Guo, C.A. Grimes, Nano Lett. 11 (2010) 203-208. M. Farhadian, P. Sangpout, G. Hosseinzadeh, J. Energy Chem. 24 (2015) 17-177.